You can find day one--a certain witch with iron teeth--here, day two--a guy with, er, dirtyhands--here, and day three--a girl with naturally blue hair--here. Ah, that blasted Pan, and one of my most favorite people in the history of ever--and a boy whose retellings I'm obsessed with. Peter Pan is the symbolism of youth and dreams, and he's a witty, spritely boy who absolutely must be real. To dress like him would be cool, but unfortunately if you're a girl all the Pan costumes are for boys or are, well, what some people call "slutty." So today I present to you a gender-bent, modern day, hipsterish version of Peter Pan--three different ways! Get dressed up then it's off to Neverland! Peter Pan's color is obviously green, but his green is not, apparently, very fashion forward, because I can't find it anywhere. So I went with the green I could find, in a skirt look, dress look, and pants look. 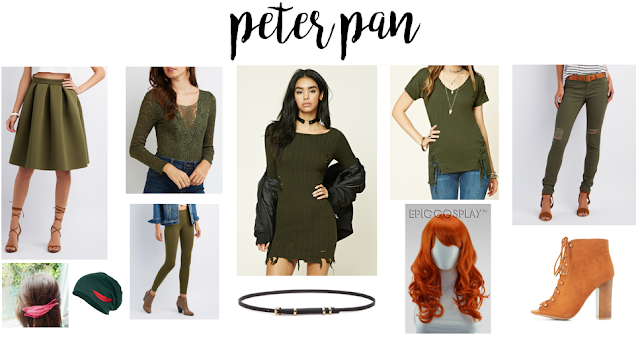 You've got the feathers and the belt and the brown shoes and the orangeish reddish hair, and then from there you can accessorize with all kinds of Peter Pan-inspired jewelry (hint hint: Etsy). Will you be growing up this Halloween? I'd like to be Polgara from the Belgariad by David Eddings because she is an inspiring character and I think her clothes must be amazing.